For more than a decade, the Dietary Approaches to Stop Hypertension (DASH) eating plan - or the high blood pressure diet - has been a model of healthy eating. Studies show that following the DASH pattern, which emphasizes fruits, vegetables, low-fat dairy and minimizes saturated fat and sodium, is effective in treating mild hypertension. The 2010 Dietary Guidelines for Americans released this past January cited the DASH pattern as a healthy eating plan for all adults, not just those with high blood pressure. The great news about DASH is that a wide variety of foods and flavors fit the pattern, so you can keep your heart healthy without losing flavor. This week's recipes come from our free DASH cookbook and many of the other user-contributed recipes on our website. For healthy hearts and happy stomachs, start with a family meal of Creamy Fettuccine with Brussels Sprouts and Mushrooms, Boston Lettuce Salad and Honey Baked Bananas. Other recipes to enjoy throughout the week include Turkey Divan with Broccoli, Strawberry Breakfast Sandwiches, Bow Tie Chicken Supper and Winter Squash Soup. For more information on the 2010 Dietary Guidelines for Americans, visit http://www.cnpp.usda.gov/DietaryGuidelines.htm. the pot and set aside. minutes. Add garlic and cook, stirring, until fragrant, about 1 minute. Add sherry (or vinegar), scraping up any brown bits; bring to a boil and cook, stirring, until almost evaporated, 10 seconds (if using vinegar) or about 1 minute (if using sherry). Whisk milk and flour in a bowl; add to the skillet with salt and pepper. Cook, stirring, until the sauce bubbles and thickens, about 2 minutes. Stir in Asiago until melted. Add the sauce to the pasta; gently toss. Serve with more cheese, if desired. Ingredient note: We prefer dry sherry, sold with other fortified wines in your wine or liquor store, instead of higher-sodium "cooking" sherry. 1. Whisk mayonnaise and mustard in a small bowl. Slowly whisk in orange juice until smooth. Stir in shallot. Season with pepper. 2. Divide lettuce among 4 plates and scatter carrot and tomatoes on top. Drizzle dressing over salads and sprinkle with tarragon (or chives), if desired. Serve immediately. orange juice; stir well, and pour juice mixture over bananas. Bake at 375 for 15 minutes. Do not overbake. 1/4 teaspoon ground black pepper Preheat oven to 350 degrees. 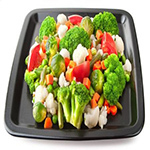 Coat a 9 x 9-inch glass baking dish with cooking spray. Steam broccoli florets until tender-crisp. In a large bowl, combine steamed broccoli, turkey breast and rice. Spread into the prepared baking dish. Whisk together fat-free milk and flour in a small bowl. In a medium saucepan, bring milk and flour mixture to a boil. Reduce heat and add cheese. salt and pepper. Simmer for 1 minute or until all cheese is melted. Pour cheese sauce over turkey, broccoli and rice mixture and stir. Bake for 30 minutes or until turkey is done and sauce is bubbly. In food processor, process cheese, honey and zest until well mixed, or mix in bowl with wooden spoon. Spread 1 tablespoon cheese mixture on cut side of 1 muffin half; top with 1/4 cup strawberries. Repeat with remaining ingredients to make 8 open-faced sandwiches.